1- Create a new Project name e.g.- SQLiteImageDemo. 2- Create a DataBaseHandler class and create database. 3-Create a SQLiteDemoActivity and call DatabaseHandler class for insert and get data from database. 4- Create a Contact class. 4- Create a ContactImageAdapter class for create custom ListView. 5-Add ListView in main.xml file. 6-Create a xml file for add Image and Text. thanks for this code ..i have run that code but its not working always gives an error like:-unfortunately your app is stopped ..How can i slove this problem?pls tell me..
App is not working when taking image from Camera. when I use putExtra(MediaStore.EXTRA_OUTPUT,fileUri) , then onActivityResult Intent data is null .And Bundle extras is also null . Also this project is very important for me. Could you email me the code zip file to me ? I am studying Android, thanks for your help. Hi thanks for your comment but I don't think there is any need to send zip code everything is clear in my blog just copy paste the code..
For any difficulty you can ask for help no issue..
Hi,I'm having problem with your code,at ContactImageAdapter.java. I am sorry Dear its my mistake just change the code. I have also make change in my code you can check it..
First of all,thanks for replying me :D.I fixed it and it showed no error. But there's another problem,it did run but it did not work :((. It keep on saying that the project has stopped,don't know why. In Log Cat window, the 1st line is "error opening trace file:No such file or directory". Your most welcome and I am feeling happy to help you. Well it should work because it is working fine my side. I think therefore some very miner issue. 1)Just do one thing uninstall application from device and then try again hope it will help you. And if not work please put your log cat(at least 5 starting line) here so I can identify error in your code. or give your email-id, I will send your zip code. your welcome & thanks for your valuable comment.. I'm a noob in android programming, I want to know why do you have 3 different constrcutors in Contact.java. Are these necessary or can I choose one that fits my implementation? Yes all constructors are needed in this application only one is extra. You can check it by yourself, just comment one by one constructor and you got red mark in your codes. I am using it for getting single record from database see DataBaseHandler.java line number 79. And this one I am using for insert image and name into database see dataBaseHandler.java line number 38. Yes yes I got you man, thank you very very much for your complete explanation :) :). Sorry for asking again, but I'm using your code the difference is that I'm building my own database in the DataBaseHelper class. As you can see I have all my images in the drawable folder and I declare these per row. While running the app I get an error "INTEGER data in nativeGetBlob"
I have read that I could use BITMAP but I have no clue how to implement this in your code I have made some changes but still not working. Do you have any idea how can I fix this to load my images from the drawable? String CREATE_TABLE_INDICA = "CREATE TABLE" + TABLE_INDICA + "("
+ KEY_ID + "INTEGER PRIMARY KEY AUTOINCREMENT,"
I solved the problem with the images in the database :), once more tnx for the help. how to select single list item? 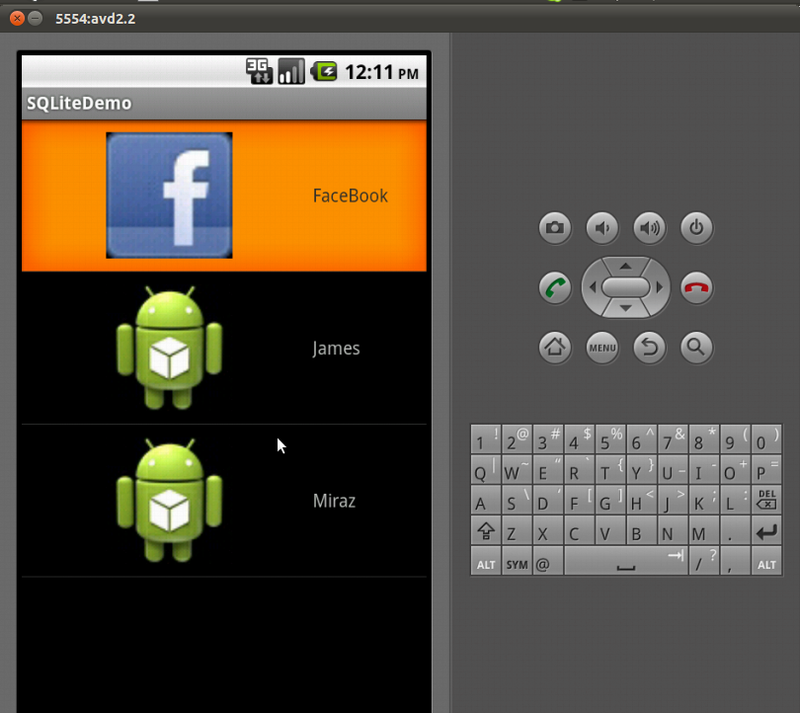 pls how to insert a sound sqlite android, when I press a picture ??? and after that when you retrieve image then play that sound with your image or what you want..
thank for your help; is the sound saved in the folder raw ??? your code worked well.Thanks a lot:) My doubt is tat how can we see the stored items in the database here.?? Thanks in advance..
No no you can't see stored data in sqlite db for this you should use sqlite query browser. or you can put it into list like I was doing. but i'm finding it hard and tried everything but no luck yet. i have only untill this friday to submit it Could you please email me the code zip file to me. Sure I will send you zip code please check your email, hope it will help you..
OK... actually am doing my final year project.. i decided to do movie ticketing app with local database sqlite.. how can i fetch the data from db and pass to next next screen... can u pl help me with code..
some thing gonna wrong in your code check your logcat and paste here so I can check it..
will be work, but doesnt start the application. Sorry for my english:) and thanks if you can help me. and please tell me your email Id so I can send you ImageLoder class.. Paste full class is not allow here..
Hi, thank you very much for your respons. My email address is: npisti686@gmail.com , and i would like to make an app what can store images in database from url and than to retrive from database. That is important because in offline mode the user could see the stored images and if he will be online and the app founds new pictures, will download it in database. I think that your sample is super for this but needs a little modification (saving from url not from drawable) if you can send me a sample i will realy greatfull. Please check your email I have sent you a idea how to implement that hope it will help you.. In this case people did not going to comment for my good work. Nothing else.. I want some reward for my work thats.. Yes sure erun you can put it in separate folder. This tutorial is very helpful. But I am not able to figure out. How to bind pre-build database with a text view? I want to fetch values form the SQL database and display them using Cursor's. I am not able to figure out what's wrong with this code. what's error you are getting? And I am surprised with your name "manish and nidhi"? and now display them into textview.. Thanks for the reply. What is the best way to show title and Image from the database? I just want to show one data row/record at a time and click on next button to show next data row/record. I don't want to show listview. If your scope is countable means till 10 images or what you want just display one image and title at one time.. When button is pressed just call query get title,image form table name where id=count. then automatic it will move to next image. don't use loop thing for small task..
that's why always you are getting first data.. Your welcome Manish and Nidhi! I used your method to inset images in to my database. I have also set password for each image. now when i click on an image it will ask for the passord from user, and i need to check if the entered password is same as the one given in the database. How can i do that any suggestions!! Hope you reply to me soon..
Hope it will help you.. I need to save the image in Data base in encrypted format. Also when i retreive it from DB i should use decryption technique to show it again.This is just to make sure the image is not used/changed by any one.can you assist? Yes Nirmal, you can use md5 or sha1 for encrypting so when you are saving image into db in byte just convert it into md5 or sha1 after that save it and same reverse process at the time of getting image from database.. I am using pre-build db for this app. Not sure why I am getting this error. 06-10 23:07:03.641: E/SQLiteDatabase(4419): Failed to open database '/data/data/com.example.quotes/databasesQuotesdb'. You have told me ones it is working fine right? then whats happen? I think you are using external database using query browser? No worry in this case its happen some time..Try after rebuild, clean your app may be it work.. Try after uninstall your app may be it work.. or try on another device or emulator may be it work..
Is there a way to fix this issue? I have large database with Images and texts. I realized after sometime that using pre build database is a better way. If i want save image from url and change image of item listview. When select item listview and will show griview contains images download. Hi then where you are facing problem? 1)just hit your server it will give you json data with image url and all detail. 2)Use image loder and convert your image url into bitmap and add them into a custom listview. 3)On tab an image from listview, display what you want in gridview.. I will upload soon on GIT server..
Hi manish, i have question. If i have multiple icons in drawable, how can it display in gridview? If the icon stored in one of the folder in sd card how i gonna to retrieve it? And after that add all data in any collection framework and display them into gridView..
How to implement touch event listener in android.I am having first page where the user enters a number and in next page the user should touch the screen only for the count specified in before page else a warning message must be displayed.. how can this be done?? ?Please help me. Why am I getting: Unable to convert BLOB to string? is sequence of column in your table. at 3rd place so it will start from 0 to 2. I have a gridview of images, I added a search widget in the action bar. I am able to produce a toast of the entered query, but when i compare the query with the data stored in the SQLite Database I'm getting a null pointer exception. This i am doing by setting OnQueryTextListener. and its methods(onQueryTextSubmit,onQueryTextChange). As a query i tried to search for the image id and image name. But for both I got null pointer exception where i am retrieving the SQLite data in the onQueryTextSubmit method of onCreateOptionMenu. Please give me a solution for this problem. If you are able to print your data in log then I can't say what going wrong.. I think some issue in your Custom Adapter where you are setting data from database. hii, manish,,i got a problem. your codes i'm implement in new database, with same concept. but listview show empty list. the problem it seems on ...ImageAdapter.java. i initiative to use log for every process, all of log appear in log cat window except method "@Override public View..." on ImageAdapter.java. i don't know what the matter, could you explain to me? Have successfully able to save data into table? and you are able to print log of your record? hey manish , finally my project was running success..
Have you copy same demo? means package name class name manifest is same? I am sorry dear for late reply. I think every thing is clear here just copy paste from above and if you got any problem let me know..
finally got a code which helped my project!! How we can get image to view using php programing (PHP My admin) in android remote server?? Use web-services and parse that web-service response. And for image use ImageLodar. Please read first web-services Rest,soap,json,xml,GET and POST method sure it will help you. can u pls upload ur .sqlite database ?????? Sure Vivek, I will inform you when upload code on git. Check my article again, a download link there.. I think because of big image size you are getting this exception. Your phone memory is low i think. Try on another phone, hope it will work. And change compress size 100% to 25% hope it will help you. I tested on Xperia S. I want to use 100 image (each image about 2Mb) from Picasa to make data source when initializing and i dont want compress before using them. Currently, i try with SQLite and catch this problem. If SQLite can not store big size image, i need change to what is the way to store image? hmmm you can't store big size image in sqlite. and 100 image never. Create web services and put your images on server..
thanks ! good one guy . Yes dear in case of some devices its happen. and till date no one got solution for this problem. please try at your end may be you got any answer. This is the camera resolution issue. you can try some step hope it will you. 1)You can try another device for testing. or 2)remove cropping code hope it will help you. Dude please check post again, there a download link..
in getView method of ContactImageAdapter class . Hello dear, try below step hope it will help you. 1)check your activity package name, it should be same as your manifest package name. 2)remove your gen and bin folder. 4)and then clean your project. Hope it will work for you.. I have requirement in which I have to save data with images-url in SQLITE data base from server.And then I have to show it in my app that means SYNC of data.When ever user want to update then only data will upload to DB.In Async task I am loading data and inserting in DB.In DB image field is BLOB type.So I am taking url image and changing it to byte type and then inserting into DB.Then from DB again I am fetching this byte image and showing to ImageView I am getting null value.but If I find it's length then it's giving some number. So what I will do???? 1)Get images url from server and convert it into bitmap using ImageLodaer Class and then save this bitmap into your database as a blob in from of byte, and where you want display it just convert into bitmap and display. 2)Get images url form server and save it into database as String field don't convert it into byte. Just save image URL as String. And where you want display it just use ImaeLoder class and display images from server. If you want use offline mode of your application then use first option else second option is more good. Great site for developers. Thank you so much! Great post..But I want to know that if I want to show the image in grid view in place of listview.Please give me a solution as I am new in android. here i put data from arrayList, you just get from sqlite and display in listview. i mean merge both project. I think you are unable to get images from database. Did you check it in log-cat? will you help with my code as I am trying to fetch data from database and show it in grid view but I am getting nullpointerexception and in my project I am having fragments,and I am getting stuck. Sorry for the trouble but I am not getting anything. 2)putt all 4 size images in your drawable (ldpi,mdpi,hdpi,xhdpi). 3)your deice automatic will from there. suppose you have a stander size page 720x1280 and here a button size of 50x100 then ask to your Photoshop designer to create that button for other resolution i.e. 480x800 and 320x400 and put them in that related folder. you can create it by yourself using android assets online. but have is problem with Lenear layout height's both device google nexus S 480-x800 or xolo play 720X1280 getting height value from hdpi - dimens both screen size same but ppi and screen resolution are dfferent....? hii ,I have external sqlite database ,database contain images and text i want to display in listview.how can do this ? and merge with this post..
How do I add a new row from database? yes it will add a new row in your database. Hi Manish ,nice post but you have just inserted image in add contact.Can you please show with any random example how to insert both image and information at the same time? You can give a textview before submit image into database and put text there. Hi Manish I have a question for you. Can you give me the coding for retrieving the image from the database as I'm finding some errors while retrieving the image some say that retrieving image should not be greater than 1 MB is it so? There is not a fix amount of data 1 MB in sq-lite but yes it is true you should not store big size data in sq-lite. Better way just create an app folder in your SD-card and put images there and save their reference in sq-lite. Hi Manish. I have a question. First of all thanks for a good example. - in getExtras() i receive null. Have you any ideas why it can happens? 1)Create an app folder into your phone-memory and save captured image in that folder. 3)Now save this path into your database directly no need to get it from extra if you already have path of that image. 4)Now show it from your sqlite. hey manish can u help me on how to store and retrieve contents from database and put it into a checklist? Hey, have you found any solution? Can u help me . I want to Store images as a grid View when User click on the image it should open in new tab. and all images should be received from JSON asmx web service. And Just problem is that when i Display images in Grid View it doesnt Load. but when i clicked on the images it load succesfully on new activity.! hi sir. i have a problem. it is not in the code but why is that when i export the project itself together with the filled database and when i install it in my phone the database do not have a data. No no in case of JAVA file storage you should run ones your app and input data then only you can get filled database. Or you can use sqlite query browser in this case you can import filled data with your project..
hmm i'm sorry i dont get what you trying to say. im sorry because im new in android development. and one more thing. after i pull out the database from the phones emulator how can i transfer the database file into my phone? Hi Manish, How about getting the image from contacts? And for image please read comments..
Hi Manish , I tried ur code but i got few errors...can u pls send me the ZIP file so tht i can check out wats wrong with my code...Please Help. I tried ur code it works very well bt I want to add Some more Information nd when I Add another field as price it is not working..
Plz Tell me how to add Price which is taken as integer in Holder..
My Fields are Mb_name ,Mb_photo,Mb_price and Mb_Dname.. I am a newcomer in android.. I want a simple program to retrieve images from database.? could you pls help me?? how to make the display into gridview? i have problem like unfortunately your app is stopped.How can i solve this problem.? Manish I want a favor from ur side my question is regarding. Db compression if we compress the sqlite db and then accesing their field value one by one and sending them to server using json/rest web services. Then my question is that is really the data will compressed which is going through webservices ?. and is it time/ network saving task or not or else pleaseeeee suggest me it is good or not n how it is possible in easy manner?? I am not getting you, can you explain in detail? If you put 3 image it will display 3 without any issue. i got error "Unfortunately camera has stopped working". Note: Above query is an assumption only, so modify it according to your need. at the main class i have an edit text that i can put a name on it and then press on a button to search for all names and phone numbers that have the same entered name. Can u help me to write the java code of the main class and for the databasehandler ? hi manish i am using your code but i got error . 2)Open your ContactImageAdapter class and call the reference of delete button, like i am doing for text and image. int rowID=picture .getID(); and follow the point number 4. 4)Open your DATABASE Class and you will see a deleteContact method inside that, now call this method from Adapter on press press delete button and pass the rowID. 5)Use the notifyDataSetChanged() every time to updated the list. Caused by: java.lang.IllegalStateException: Couldn't read row 0, col 0 from CursorWindow. Make sure the Cursor is initialized correctly before accessing data from it. Do you know why this could be happening? The image is quite small, only 3.28K. Smith, I think you modified something into database and you did not uninstall application from your phone before re-run. Best practice, when you working on sq-lite and modified any table just uninstall the app and reinstall it again. Hope it will help you! hiii can u tell me how to insert image to database only. how do I add multiple records with different image names to the SQLite DB. And image name you have to write manually or take input from user using editbox.